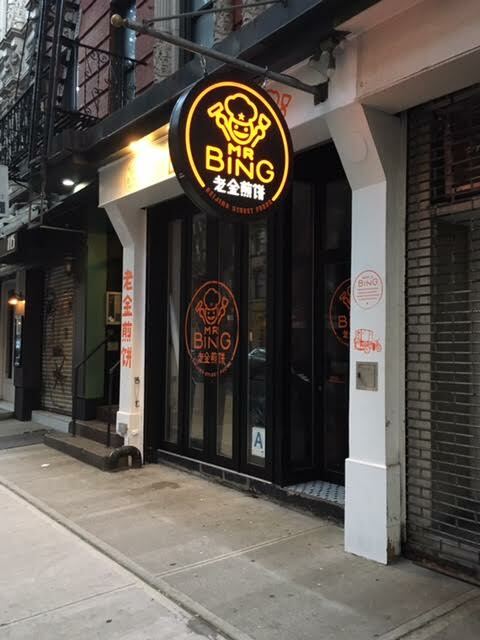 Mr. Bing has been in soft-open mode this past week at 115 St. Mark's Place between Avenue A and First Avenue. The quick-serve shop, which specializes in the Northern Chinese street food crepe — aka a jianbing or bing for short — is having its Grand Opening tomorrow morning. Per the EVG inbox: "The first 100 customers will enjoy a free bing [starting] at 11 a.m."
This is one of three new Mr. Bings to open in NYC. The St. Mark's Place location is apparently "the first to offer seating and late hours." The news announcement about the opening notes that "wine and beer [is] coming later this fall." The previous EVG post on Mr. Bing has more on the owner and operation. I went there during their soft opening and shared a vegetable crepe. The crepe itself was tasty enough, but we had trouble finding the vegetables. For $10 it was not a good deal. I like my street food fast, tasty, and cheap. Once you take the cheap out of the equation I'm not interested. But even at $5 I would not return to Mr. Bing. Thumbs down. They can't last for three months without selling booze? Jesus, we might as well pump the East River full of alcohol and just turn the whole neighborhood into a pleasure district. "Jesus, we might as well pump the East River full of alcohol and just turn the whole neighborhood into a pleasure district." Many a truth is spoken in jest. A pleasure district, eh? Anon 12:33 - In feudal Japan, when Tokyo was called Edo, an entire section of the city, known as Yoshiwara, was designated as the pleasure district, or pleasure quarter. It was both walled and moated to separate it from the "proper" part of the city and the "decent" residents, and in it were all the bars, straight and gay brothels, gambling establishments, and other vice-ridden joints the era had to offer, and it was visited by men from all over Japan looking to get drunk, get laid, act out (although it was strictly regulated, with its own health clinics and doctors). There are plenty of times the EV/LES reminds me of that kind of environment, hence my usage of the term. They also had such districts in Osaka and Kyoto, but the one in Edo was the largest, if memory serves.